Did you know that Easter Sunday, the first Sunday after the Paschal Full Moon, can occur between March 22rd and April 25th in Western Christianity? A true 'movable Holiday.' In 2017, it fell on April 16th. This year it will fall on April 1st. which is also April Fool's Day. And, in 2019, Easter Sunday will arrive on April 21st. Easter Sunday celebrates the resurrection of Christ, in accordance with Christian Scripture. It represents the promise of new life, here on earth and in heaven. Opening an 'Easter Egg' actually symbolizes rebirth. Easter egg hunts are the Holiday favorite, for children of all ages. But, no one likes the smell of a rotten egg left behind! When the Easter egg hunt is held outdoors, this isn't a huge problem, since scavengers will eventually find and dispose of the remains. But, when bad weather or the environment forces the hunt indoors, a well hidden egg may go unnoticed. Read the following, for a fun alternative. 1. Gathering the Easter supplies in the 'Materials Required' list should be very easy to do, just before the Holiday. Most Grocery Stores and Mass Market Merchandisers prepare by filling their shelves! One thing to consider, when choosing candies and confections, possible food allergies to nuts, egg and dairy, etc. Add to that, of course, whether or not they'll fit inside of the plastic eggs. Don't forget the Easter egg baskets or plastic pails. The kids will need something suitable to carry their eggs in as they find them. 2. Fill the eggs and snap them closed tightly to keep from attracting insects for a hunt conducted indoors. If you stuff them full, consider the sugar overload possibilities. Mix and match the contents as you see fit. You might even consider putting Easter toys or another 'special prize' inside of one, even if just a note saying they won something too big to fit inside. Of course, you'll need something as a prize; perhaps a brand new sugar-free Easter coloring book & crayons? Hopefully, you already have a supply of lightly used coloring books and crayons for the others to use as well. 3. Hiding candy filled eggs outdoors? Keep them out of the heat of the sun. Specify which areas to search, so the kids won't wander off into the woods or out into traffic. Be sure to have enough Adult eyes available to watch over the proceedings. Hopefully, you won't have to referee any fights, since there's always competition when candy and prizes are involved. 4. Hiding candy filled eggs indoors? Set ground rules. Specify which rooms you included and which you left off limits. Take into careful consideration obstacles such as furniture, stair ways, glass collectibles, etc. Again, be sure you have a good ratio of Adults to help contain the melee. Try not to turn a dozen little Bulls loose in the china shop! 5. Make all the kids wait until you have decided the hunt over by count, before opening the eggs. Having them sit down in a circle works well. Encourage them to barter and trade with each other until satisfied. Be sure the kids understand to eat their candy in moderation, savoring it so it'll last longer. Call this reverse psychology, since you really don't want them to have too much sugar at once! 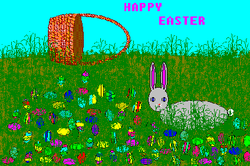 * Consider electronic beeping Easter eggs, for visually impaired children. * Dye hard boiled eggs as a fun project, but use them in a centerpiece on the snack or Dinner table. * Peel any leftover hard boiled eggs for use in egg salad. * Take the time to explain the symbolism to the children. After all, Holidays have become way too commercialized! When the Christian faith adopted this tradition, Easter eggs were all dyed red to represent the blood/sacrifice of Christ. The shell of the egg represents the sealed cave Christs' body was placed in. Cracking and removing the shell represents the Resurrection. * Need help with real eggs? Read "How to Boil Eggs Without Cracking Shells." * Have the egg hunt at the beginning of the festivities so the kids have time to burn off the sugar rush and settle down before the evening meal or Church Service. * Any time you involve a large group of children in an outdoor activity, especially when you may not be aware of potential food or insect sting allergies, keep fresh Epi-Pens (epinephrine) on hand as part of a well supplied First Aid Kit. Ask Parents ahead of time about allergies. * When holding an Easter egg hunt indoors, as an extremely important part of child-proofing the rooms to be searched, be sure to remove and secure any dangerous items such as knives and firearms!